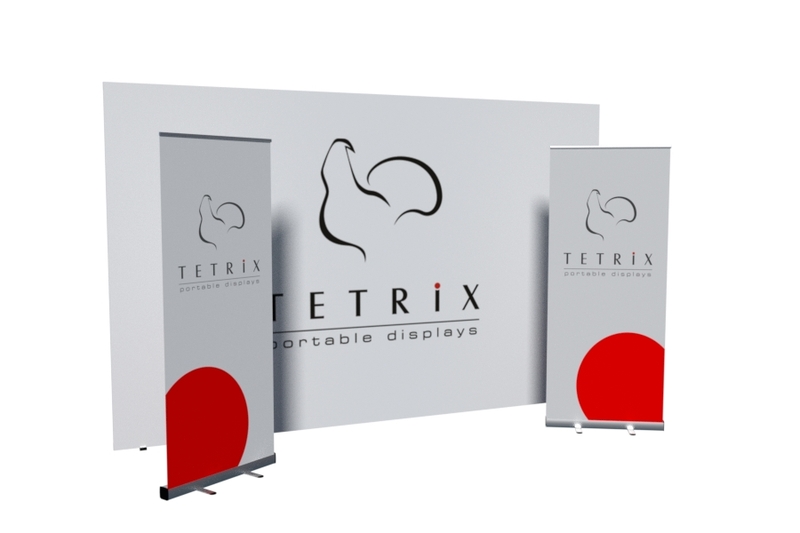 An effective exhibition stand is supposed to attract your customers and make the marketing work easy for the personnel. It matters how you look and it matters for the people working on the stand, how proudly they are presented by the company. 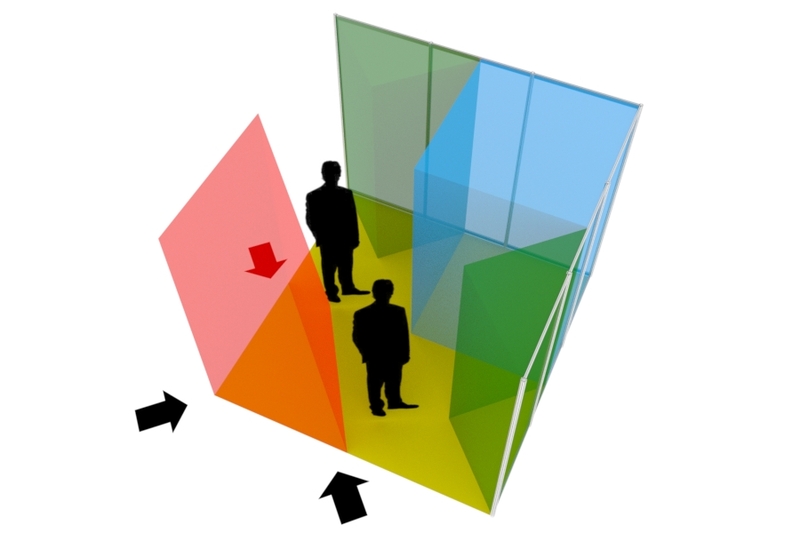 1 Think X, think Y, think Z to understand the visibility of your Expo Box. A straight expo are that is open on e sides. The exhibition stand consist mainly of a back wall and does not need to be surrounded by other structures. A Corner Stand that is open to 2 sides and consists of two back walls in a 90 degree angle. 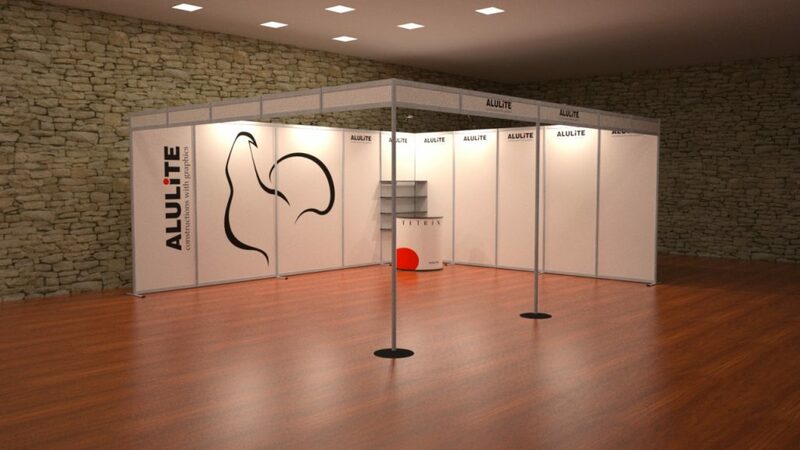 A U-shaped exhibition stand that is fitted in a line of other stands and that has one opening towards an aisle. The Expo Box consists of a back wall and two side walls. A O-shaped stand in the middle of the expo area that is open to all 4 sides. Basically the “island” exhibition stand does not need any walls yet requires structures with advertising to be noticed by the customer. Secondly make the exhibition booth work for you so that the visibility is at a maximum and the people working on the stand can interact with your customers. We call it the stairs of visibility. The important thing is that nothing is disturbing with the visible functionality of the stand, so that it is a working unit also when filled with staff and customers. As we mentioned before, your stand area consists of different areas with varying force of attraction. 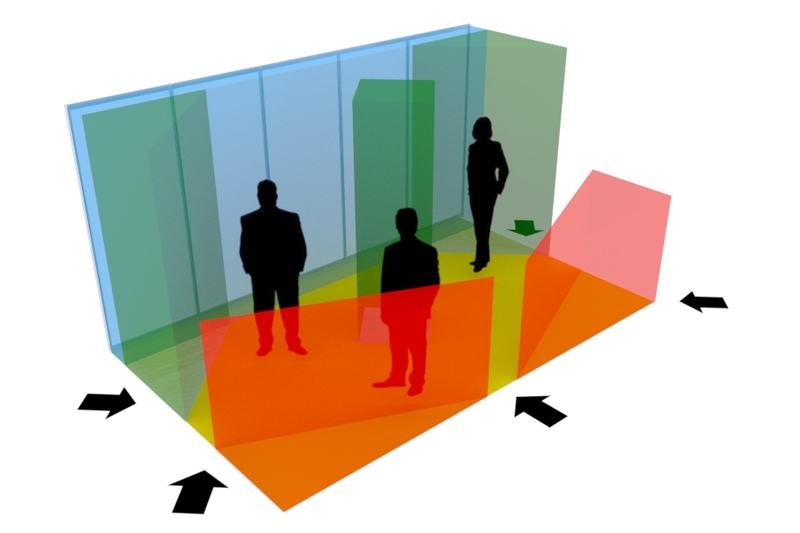 The hot spot areas are seen from the most angle by your customers and these are the most important eye-catchers. Then we have the informative area where your staff works, and finally we have the background which is for branding and long term marketing messages. By following the idea of making your expo stand customer friendly and offer maximum visibility of the booth, you should think in three dimensions. Like the places of attraction the front of the stand carries the best, “hot” visibility and the back of the stand is a “colder” back areas of the exhibition stand. At the front end the most valuable visibility lies, and though it should be given the most space and the best selling items should be lifted forward it can not be done at the expense of the total functionality of the exhibition booth. As an addition to these 3 main areas you can also ad a SUPPORT area to the exhibition stand. The SUPPORT area can be located anywhere in the exhibition stand through HOTSPOT – INFORMATIVE – BRANDING is featured in the color green. The different attraction areas are located in the places where they are noticed by most people. In different exhibition stand models the area varies. The areas of attraction also varies with the size of the stand. 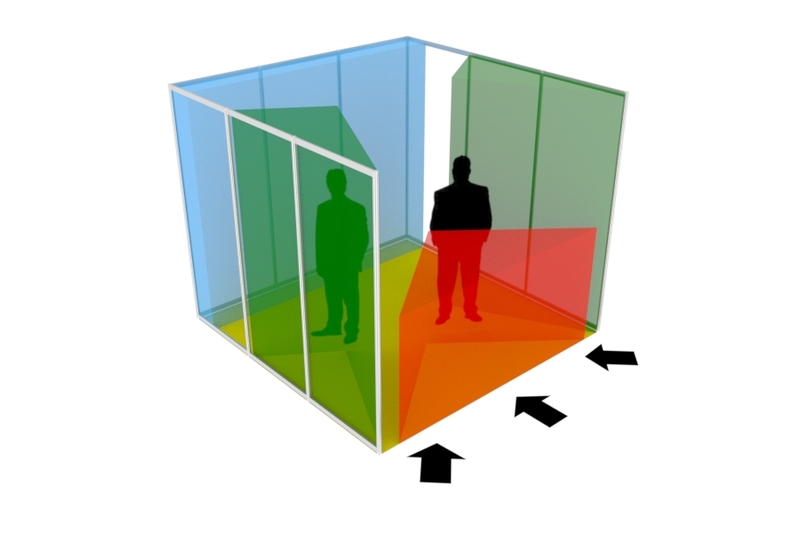 Following the booth maps below, and the “stairs of visibility” model, you can build a more effective exhibition booth – enabling better sales. The HOT-SPOT areas are in the 2 corners, yet the stand offer a great presentation of the whole stand and has a great area for informative messages. Great for presenting products that has a big news value and needs to be seen by the masses. “Growth & sales” are keywords. The point with this shape of booth is that you want to attract sales fast and grow the customer base. A fresh and new spirit looking to find buyers and possibly resellers for products or services. Recommended: Stylish, continues, graphics with SlimFrame gives most room for the Branding and informative area. 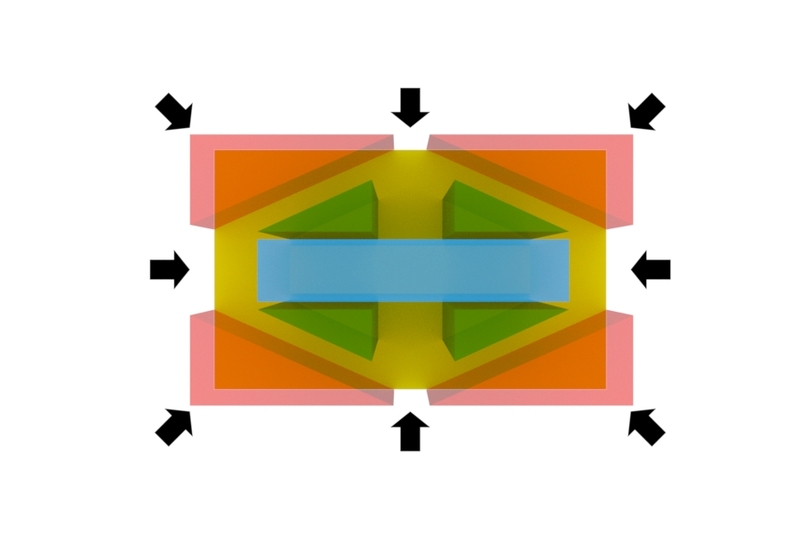 The hot spots can be built in the same series to maximize the great looks. The HOT-SPOT area is in the corner and leaves an OK area for informative areas and a great branding area. This is a basic must shape of exhibition stand to companies that want to stay fresh and attract new customers on a longer term basis. “Forward moving” are the keywords. The company is already established and wants to find new customers. Products or services does not need to be sold urgently but there is a need for visibility to ensure old customers of your existence and build for the future. Recommended: The flexible AluLite can easily offer a new stand shape for every event. Looking classic and stable you can push new products and add functionalities to your stand. 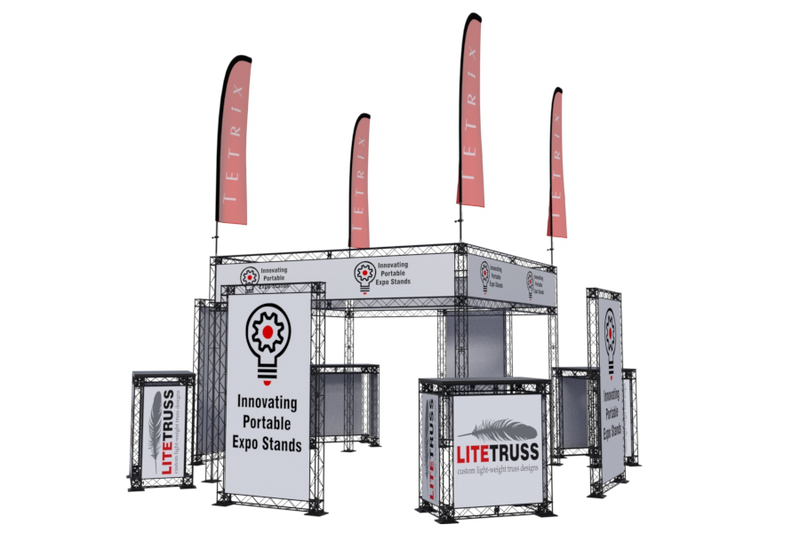 U-Shaped exhibition stands are affordable, common spaces on a show. 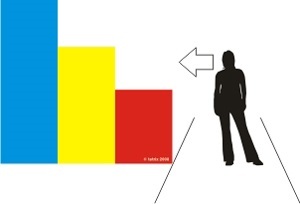 A small 3-wall stand area has a singel small point of attraction (HOT SPOT) that can only be widened by a considerable change in the total area of the stand. 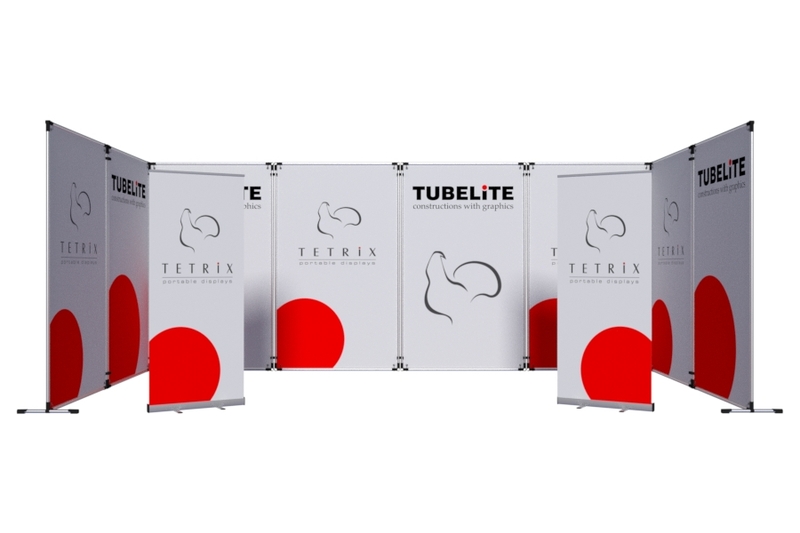 Recommended: TubeLite offers printed walls and cheap updating of prints. Even with a low budget you can look great and ad exciting graphics to your stand. The HOT-SPOTis basically the whole exhibition stand. This island of sales is the market leader or bringing a revolution to the market. Effektive urgent sales and all cards on the table will bring high awareness to the product or service news. This booth is about making money fast and growing huge number of customers. It is bringing a new era or establishing for everyone to see who is the next boss in the market segment. On these kind of stands business is taken out most seriously. The exhibition show is there for the company to make a strong point. Keywords are “Revolutionary news and market leadership”. Recommended: LiteTruss with high constructions. The light weight truss makes it easy to build on height and the look of the product is Rock n’ Roll, fast moving and stylish.